Google announced lots of new features last week, and one of the most exciting is Advanced Segments. There are already some great posts out there in the analytics blogosphere explaining what Advanced Segments are all about and how to use them (here’s one from Justin Cutroni, and one from Avinash Kaushik). But we wanted to take a few minutes to compare and contrast using Advanced Segments vs. using profiles and filters to get a different view of the same site. Up until now, there were some reports in Google Analytics, like the Visitor Loyalty reports and the Funnel Visualization report, that you could only segment by creating a new profile for your site with filters on it to get just the traffic you want. 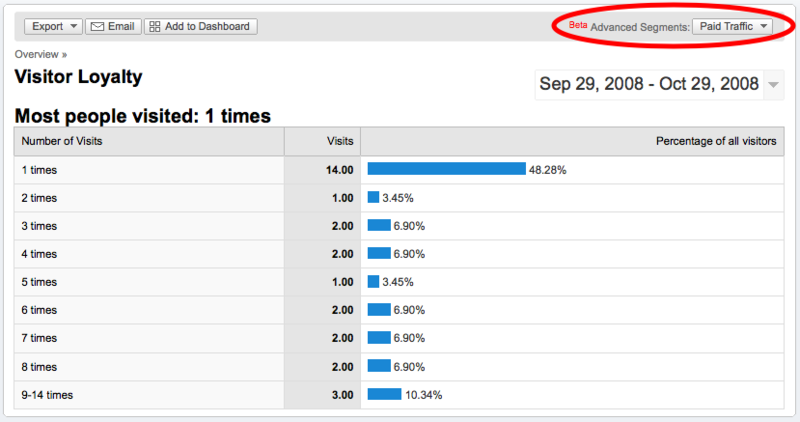 For example, do you want to see the Visitor Loyalty report just for your paid search visitors? Create a profile that only includes your paid search traffic. We’ve done lots of posts about filters in the past detailing how they work to set up exactly these kinds of things. And the real upshot of using Advanced Segmentation is, you can look back historically on the data! With profiles and filters, the changes you make only have an effect from the time you make the change going forward. With Advanced Segmentation, the report instantly shows you the segments for the historical data you have. Advanced Segmentation has several other advantages as well. You can see multiple advanced segments simultaneously in the same report. You can also create advanced segments that wouldn’t have been easy or even possible with filters, such as segments for visits with metrics in a certain range (more than 3 pageviews, more than 2:00 on site, and so on). And finally, the interface for creating advanced segments is much more intuitive than creating filters — you don’t necessarily need to understand regular expression to create most advanced segments you can dream up. Segment previously un-segmentable reports (except Funnel Visualization), including historic data. See multiple advanced segments at once in the same report. Types of segmentation that weren’t possible with filters: visits with conversion, visits with more than 3 pageviews, visits that spent more than 2:00 on the site, etc. More intuitive to set up for non-technical users. Tied to a user login. Still useful for filtering certain kinds of traffic you almost always want to exclude, like your internal traffic. Segment the Funnel Visualization report. Use multiple profiles for more than four goals. Tied to the Google Analytics account, manage access with the User Manager.